Is There a Link Between Dandruff and Hair Loss? They’re both conditions that make people worry about their hair. But is there a connection between dandruff and hair loss? Many people have a negative reaction when they look into the mirror and see dandruff. The same is true for those who notice that they have hair loss or thinning hair. In both cases, you want to seek treatment. RHRLI offers a permanent solution for patients who are losing hair. It’s called the ARTAS® System, and we’re the only hair loss treatment center on Long Island that offers this state-of-the-art technology. We’re hair experts so we want to give you the facts and myths related to the connection between dandruff and thinning hair. Most everyone knows that dandruff is dry white flaking of the skin from your head that can get onto your clothing. It’s also known for being extremely itchy. According to the Mayo Clinic, dandruff has several causes. One of the most common conditions is irritated, oily skin, which is called seborrheic dermatitis. This affects your scalp and other areas that have an abundance of oil glands, such as your eyebrows, breastbone, groin area, the back of your ears and the side of your nose. You can tell that you have seborrheic dermatitis if you have red greasy skin covered with flaky white or yellow scales. Dandruff can also be caused by not shampooing enough, dry skin, sensitivity to hair care products and malassezia, a yeast-like fungus that lives on the scalps of most adults. The causes of dandruff are different from the causes of hair loss. The most common type of hair loss for both men and women is called androgenic alopecia. This is also known as male and female pattern hair loss and is caused by the conversion of testosterone to dihydrotestosterone (DHT), according to the American Hair Loss Association (AHLA). DHT causes hair follicles to shrink making hair thin. Eventually, the follicles, which are the tiny holes in the skin where hair is located, shrink to the point where hair is no longer able to grow. 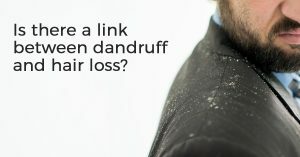 So while there isn’t much of a connection between dandruff and male or female pattern hair loss, there is a link between one cause of dandruff and a type of hair loss. According to AHLA, there is a connection between seborrheic dermatitis and loss of hair. But the hair loss is only temporary. The treatment for seborrheic dermatitis usually involves using a medicated anti-dandruff shampoo, or sometimes an antibiotic prescription. The inflammation can also be controlled by a corticosteroid cream or lotion. Once treated, hair will grow back. One thing to look out for is making sure that fear of hair loss doesn’t bring about more severe dandruff. Dr. Michele Green, a New York dermatologist, told WebMD that some patients see their hair fall out when they wash their scalp and decide to stop washing. The connection between dandruff and mild hair loss is easily treatable, but there is no connection between dandruff and male or female pattern hair loss which can be a more permanent condition. If you’re seeking a permanent solution to your hair loss, the robotic technology employed by the ARTAS® System will leave you with a healthier head of hair. The procedure is minimally invasive and is the most accurate hair transplant you can find. For more information, contact us today.